Welcome podcast listeners, visiting via the Von Glitschka recommendation of my sketchnotes on Freelance Radio 35. 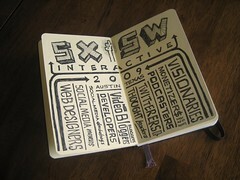 Sketchnotes are a visual note-taking technique, featuring a combo of hand-drawn sketches, typography and text notes. I capture talks & presentations in real time with this technique, using a black gel pen and a pocket Moleskine sketchbook. Check out the VizThinkU: Visual Note-Taking 101 Webinar I did with Sunni Brown, Austin Kleon and Dave Gray. In the webinar, we share our techniques and tips for taking visual notes and thoughts on their benefits over regular notes. I'm professional designer and art director, specializing in logo, icon & web design. Feel free to have a look around the site or send me a note. Nice, thanks for sharing. I like the style of your sketches. The Alaska cruise ones are my favourite.